Some of the most meaningful experiences a student has during their elementary through high school careers happen during class field trips. Most notable for many is the school bus ride on the way to or from the day’s planned activity, where the bus is often filled with meaningful conversations, games, laughs, and even singing. 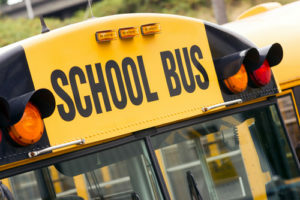 However, many students and parents may not be aware of just how dangerous a school bus trip can be, especially when busy highways are a necessary part of the route. This fact was recently highlighted during a horrific bus accident that occurred on Interstate 80 in Morris County, NJ last Thursday morning. Fifth graders from East Brook Middle School in Paramus were supposed to be enjoying a day at Waterloo Village in Sussex County. But tragedy struck at 10:21 a.m. as the three buses were making their way to the living history museum. According to reports, one of the school bus drivers had accidentally missed their exit. The driver then attempted to make an illegal U-turn in a highway median causing a dump truck to strike the bus from behind — leaving one student and a teacher dead. The school bus was transporting thirty-eight students and seven adults. In addition to the two that died, forty-three people were injured and transported to local hospitals for treatment. Some of those patients are in critical condition and are still undergoing surgery. After the collision, the bus landed on its side, spread dangerously across the median of the highway. It has been reported that students were dangling from their seatbelts, and amidst the screams and chaos, they were frantically trying to exit the bus from open windows and the emergency exit hatch in the roof. Officials are investigating the crash and Democratic state Sen. Joseph Lagana has called for a special transportation committee hearing to analyze safety standards. When an accident occurs between a school bus and a commercial dump truck, the aftermath is often tragic and the injuries are catastrophic. Aside from death, injuries suffered can range from scrapes and bruises to fractured/broken bones, traumatic brain and head injury, neck and spinal cord injuries, back injuries, internal injuries, and psychological and psychiatric trauma. Many of these injuries can impact a person’s life forever and can be debilitating in more ways than just physically. Victims of bus accidents often face emotional challenges as they cope with the loss of friends and teachers, on top of new and sometimes permanent injuries. And that’s not even to mention the continual financial costs that come with treatment, surgeries, and rehabilitative programs. Although injuries like scrapes and bruises can heal quickly, victims dealing with great emotional stress following a horrific accident can also end up taking on financial burdens associated with their trauma in addition to their pain and suffering. If you or a loved one has suffered injuries at the hands of a negligent party, you should not be responsible for covering all associated expenses. Instead, you should consult an experienced personal injury attorney to discuss your options today. If you were hurt in an automobile or bus accident at the hands of a negligent driver in New Jersey, then you should contact the lawyers at Blume Forte Fried Zerres & Molinari. With a strong track record of successfully handling many personal injury cases, they can help you get the justice and compensation you deserve. They also handle the full gamut of personal injury cases, so if you were injured in a slip-and-fall accident, by a defective product, or because of medical malpractice, the lawyers at Blume Forte Fried Zerres & Molinari can help. All you have to do is pick up the phone and dial 973-635-5400 or fill out our online contact form to begin discussing your case today.